Laurence Dale studied singing at London's Guildhall School of Music and Drama with Rudolf Piernay and the Mozarteum in Salzburg, gleaning experiences from such diverse talents as Sir Peter Pears, Sir Colin Davis, Richard Miller, Seth Riggs, Peter Brook, Patrice Chereau, Nikolaus Harnoncourt, Herbert Wernicke, Antonio Pappano, Peter Stein, Karl Ernst and Uschi Herrmann, Sir Charles Mackerras, Rudolf Nureyev, Giorgio Strehler, John Eliot Gardiner, Götz Friedrich, Pierre Boulez, Sylvain Cambreling, Christian Thielemann, Daniel Barenboim and Ruth Berghaus. Amongst many Mozartian rôles, as well as baroque and romantic, his portrayal of Tamino, with which he opened Mozart year in Salzburg in 1991 was described as 'legendary'. He performed this rôle regularly in Vienna's Staatsoper and Berlin's Deutsche Oper, then in Paris and throughout the world. 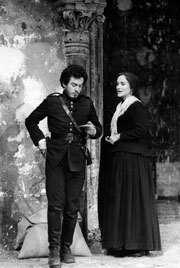 In 1990 Marcel Prawy, the doyen of Viennese opera, described him as "the best Tamino since Wunderlich". 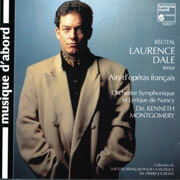 In 1992, he created the title rôle of Rodrigue in the premiere of Debussy's Rodrigue et Chimène to open the Nouvel Opéra National de Lyon, recorded for Erato, under the direction of Kent Nagano. Following the performances of Monteverdi's Orfeo as celebrations for Herbert Wernicke's Monteverdi year production at the 1993 Salzburg Festival, Laurence Dale recorded the title rôle under the direction of René Jacobs for Harmonia Mundi. For many specialists, it is the recording of reference. His recital CD of French 19th century repertoire is regarded as an example of style and refinement. He has recorded under the direction of Georges Prêtre, Gounod's La Messe de Ste Cecilia along side Barbara Hendricks and Jean-Philippe Lafont, Mozart's C minor mass with Franz Welser-Most, and the title rôles of Auber's Gustave III and Mehul's Joseph en Egypte.